There are some of us who love meandering along trails, looking closely at flowers and foliage, debating taxonomy. We are a small but enthusiastic subset, it’s true–but what fun to be with folks of similar mind! Last weekend I tagged along with the Marin chapter of the California Native Plant Society. Our hike rambled out through the serpentine chaparral of Carson Ridge, then down into a peaceful valley to admire Carson Falls. This hike showcases the wealth of nature in Marin–there are undeveloped hills and valleys spreading as far as the eye can see, in all directions but south-east, where the Bay and its surrounding cities shine like gems. It’s amazing to think that the vast landscape we were hiking into is protected–mainly, where we were, by the Marin Municipal Water District. But MMWD land abuts County open space, State Park land, and National Parks as well, forming a great swath of public land, free for both wildlife and people. It was not a fast hike–but that is how I like it. There was plenty of time for photos, and I learned a lot, both from my highly knowledgeable fellow hikers and from our adept leader Amelia Ryan (who, in full disclosure, I’ve been friends with since I was six). The sun was shining, scenery was beautiful, the falls were lovely, and the company was good. What a treat. 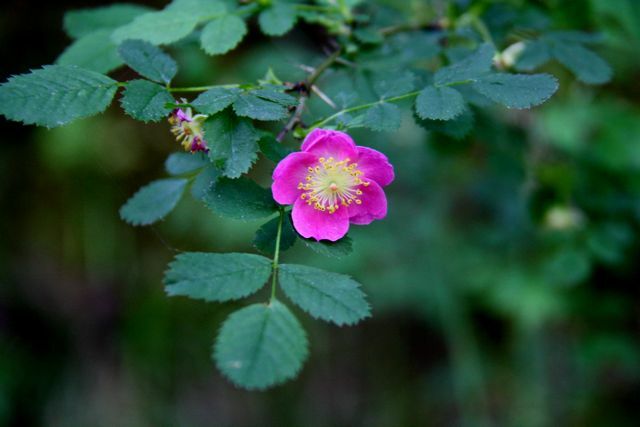 Though a lot of flowers are blooming right now, most of them are non-natives; of the few native blooms you might see, many are understated and easy to miss–so keep your eyes peeled! 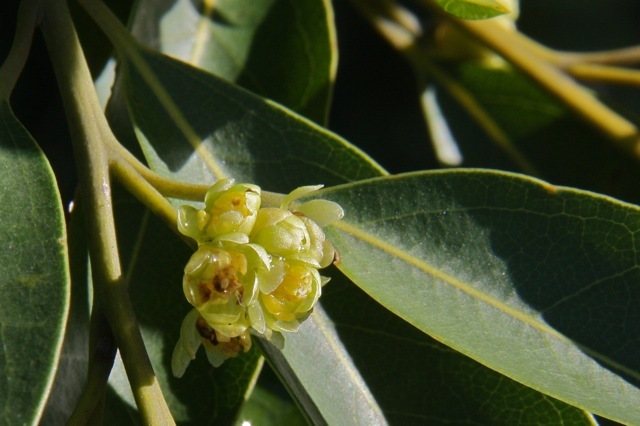 Recently tiny yellow-green flowers have started to pop out on pepperwood (bay) trees, which I wrote about back in October. You have to look close to see them: six petals cupped around a cluster of stubby yellow stamens–by fall these will swell and ripen into purple, yellow, and green globes. This morning, Bolinas is an island of sunshine in a sea of fog. Mist is spilling over the ridge. San Francisco is shrouded, as well as all of the Pacific. But all around the shore, the waves are sparkling and studded with surfers. A gentle and oddly warm wind has been blowing since dawn, and on my early-morning walk everything seems to glitter and dance. I wrote this yesterday… but today is almost as lovely! Ramble downhill through a wonderland of ferns and old-growth redwoods. Huge old trunks tower over your head, and beams of sunlight filter down along with birdsong and the sweet smell of the branches. This is the Steep Ravine trail, and it’s aptly named. The ravine that it follows is steep, with towering canyon walls rising up on both sides from a narrow boulder-strewn creek below. In places, giant redwoods have fallen and wedged between the banks, like rustic bridges or a giant game of pick-up sticks. The trail itself is also steep, dropping precipitously down the flanks of Mt. Tam. A little over half-way from the Pantoll Parking Lot, there’s a sturdy 10-foot wooden ladder to help hikers down a particularly steep spot. 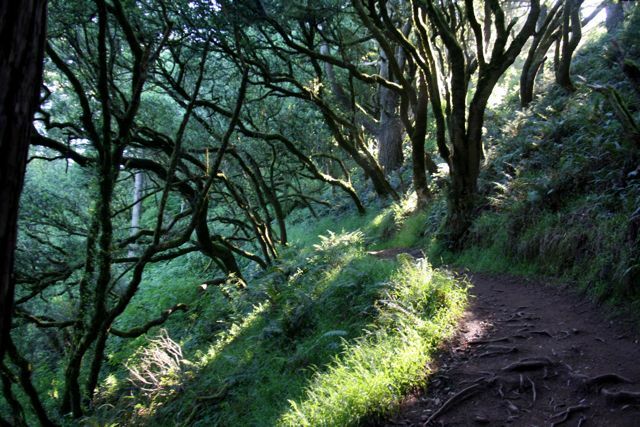 The uphill leg of the loop is a chunk of the Dipsea trail, which Steep Ravine merges in to after nearly two miles. At this junction you can either keep heading downhill to Stinson Beach, or you can turn left to head up the Dipsea (I like to do the loop hike in this direction since this part of the Dipsea has a LOT of steep stairs, which can get slippery when it’s wet. But in any weather I’d rather go up these stairs than down them). The Dipsea leg is as beautiful as the Steep Ravine leg – the first section of the climb is so steep that it feels like you’re in a tree fort. The crowns of big old Doug firs are at eye level when you look out over the canyon. Later in the hike you pass through huckleberry stands, dense groves of skinny (young?) redwoods, gnarled oaks and bays, and then out into the high Tamalpais grassland with sweeping views of the Pacific ocean. The trail heads south for a ways before meeting up with the Coastal Fire Road that leads you back to Pantoll. This loop is a great spot to see a lot of different kinds of plants. The microclimate changes sharply as you move up and down the mountain, from the narrow moist ravine into the open high-elevation grassland. There are many species of shade-loving ferns and lots of wildflowers. At this time of year, a lot of plants were in fruit but I still saw lots of blooms as well. If you’re coming from Stinson Beach, you can also start this hike at the bottom end of the loop instead of at Pantoll. Park in the large turnout near a metal access gate, right before the big metal “Mt. Tamalpais State Park” sign. 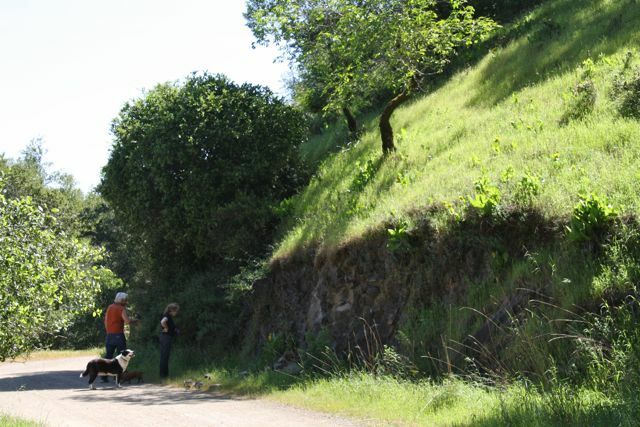 Then you can head uphill on the Dipsea for half a mile, until you come to the Steep Ravine junction. Veer left across a aged wooden footbridge to do the uphill leg of the loop on the Dipsea. 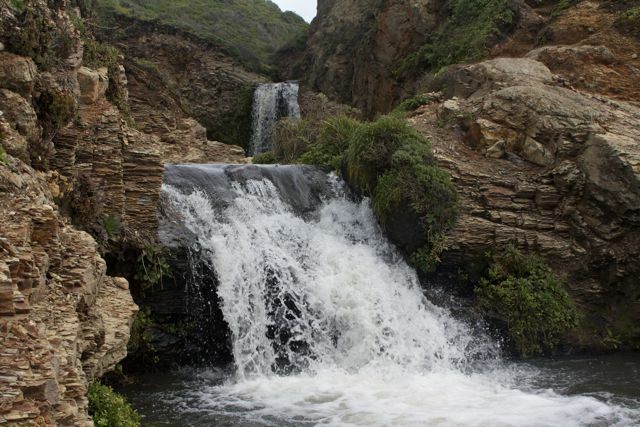 For one of the best hikes in Marin, take the trek past Bass Lake to Alamere Falls. All through the spring this trail offers a wildflower bonanza–but it’s a treat at any time of year. The views are any over-the-top word you’d like to use: spectacular, breath-taking, awesome. But my favorite thing is that you pass through such a diversity of landscapes. Beginning from the eucalyptus forest at the Palomarin trailhead, you follow the Coast Trail along the bluffs high above the ocean. The wide and well-maintained trail bends inland in places, so when you aren’t walking along windswept and view-ridden hillsides, you dip down into lush and sheltered gullies filled with greenery and the trickling sound of small creeks. The gentle ups and downs of the trail give you a workout but nothing particularly daunting. After (very approximately) two miles of this, you reach the only climb of any steepness on the trail, which dog-legs away from the water and heads up a smallish ridge. You then hike in and out of a forest of Douglas fir and alder until the views give way unexpectedly to Bass Lake, a placid tree-skirted spot. Not long after this, you begin to drop down out off of the ridge, passing another little lake (Pelican) on your left and once again heading into the treeless coastal scrub. The trail down to Alamere Falls is unmaintained, but used often enough that it’s not too overgrown. The trail is somewhat eroded though, and it’s a tiny bit of a scramble to reach the falls. But very well worth it. What unusual falls these are! As you approach them, you’re not even sure what you’re seeing. You’re walking toward the ocean but high above it on a bluff, headed the same direction as the stream. 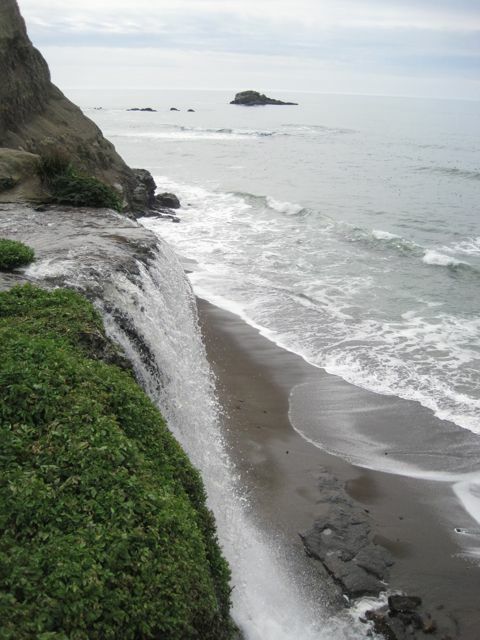 As you get closer, you realize that the creek stair-steps down low crumbled cliffs, streams across the level surface of the bluff, and then disappears over the cliff to crash onto the beach about 50 feet below. Pack a lunch if you go since the total distance is just over eight miles, round trip. And if you’re not a people-person, be warned that this trail can be jam-packed by midmorning on weekends. It’s on the popular Coast Trail, which links up with many other trails on the Point Reyes Peninsula, and also connects to various campgrounds. Check here for more info, directions and so on. Really this is an unpaved access road, not a trail – but it’s a great spot to see a wide variety of wildflowers right now. In fact, it is the steep road cut that seems to account for much of the diversity. From the weedy forget-me-nots growing along the seep spring near the beginning of the road, you’ll pass through many different combinations of sun, shade and soil. The level road curves around the canyons and hills of the Marin Municipal Water District, and different flowers appear around every curve. I went out with my parents (happy mother’s day mom!) and we saw jewel flower, Chinese houses, Larkspur, linanthus, woodland star, iris, and many many more. There was a dry, rocky hillside with tall sticky monekyflower bushes laden with blooms, through which a morning glory vine had grown so its large white flowers floated on a sea of orange. In a damp ravine, crimson columbine grew in a garden of other flowers including purple iris and forget-me-nots. When I got home, my plant list had 81 species on it, and 53 of those had been in flower! This is an easy hike since it’s flat, but you can turn it into a more vigorous outing by connecting up with the network of trails that extends down into Deer Park or up onto the rest of the MMWD property – you could go all the way to the top of Mt. Tam if you wanted to! To get there, head up the Bolinas-Fairfax road as if you were going to Bon Tempe Lake, but at the turnoff to the lake instead park in one of the limited pullouts on the downhill side of the road. Concrete Pipe Trail starts on the other side of the gate. The views are amazing on this high rocky ridge, and so are the plants. Dense stands of chaparral suddenly open onto stony serpentine outcrops supporting those hardy plants that can survive on such nutrient-poor soils. Right now ceanothus and manzanita are in bloom, and there are scattered meadows filled with wildflowers – goldfields, poppies, lupine, falselupine, and many more. Get to Pine Mountain by driving up Bolinas-Fairfax road. 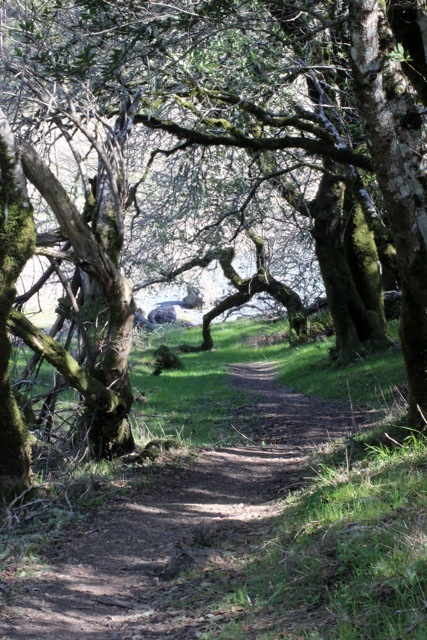 The ridge runs northwest from a big turnout – you can walk all the way in to the San Geronimo Valley from here, on a wonderful network of trails and through a lovely rare forest of dwarfed Sargent cypress. There are no roads or houses in this area, and so as you walk often all you see is a tangle of forested ridges and valleys. And when you turn around and head home, you get sweeping views of the bay, the Richmond bridge, and Mt. Tam! ground. But the understory was still vibrant, with lots of iris and houndstongue. And the meadows are lovely – filled with wildflowers at this time of year. Along the way I embarrassed myself by not being able to remember the Latin names of miniature lupine, blue-eyed grass, or California poppy (which I even wrote about yesterday!). Those are Lupinus bicolor, Sisyrinchium bellum, and Eschscholtzia californica, by the way.